The Birds Nest Fern or Asplenium Australascium (see picture right) is native to a number of countries including Australia. Wholesale growers offer this fern in sizes from small potted specimens through to more advanced plants ready to make an instant impact in any landscaping project. This is a rainforest fern and as such requires moist conditions, actually they are not only epiphytic ferns that will grow on trees and lithophytic that will grow in rocks, but also have the ability to grow in soil as well. Drainage is as important as moisture, no water logged conditions for this fern. It is naturally found growing from the Cape York peninsula down to Southern New South Wales in rainforest areas, filtered light is best as this mimics natural conditions. Easy to grow in a range of climates and suited to Melbourne, Sydney and further north trough Queensland. The large fronds open out to form a nice round ‘nest’ and Asplenium australascium makes an excellent feature plant in the garden or in a container. Protection from heavy frosts is advisable. Position – Filtered light or Dappled shade. Soil – Humus rich well drained soil. The Birds nest fern does not to wet soil. Height – To around .75 metre. Spread – To around 1m. Fertiliser – In a good soil, Birds nest ferns require very little fertiliser. An application of compost and mulch each year is often sufficient. You can add a little blood and bone to the root zone at this time. You can foliar feed with a seaweed or vermicast tea if you wish. Pruning is generally not required, other than the removal of old dead fronds for cosmetic reasons. 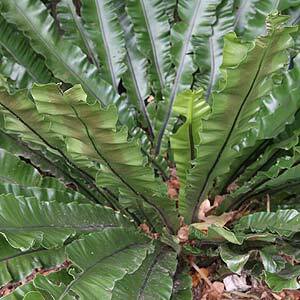 Asplenium australascium is suited to growing as a feature plant in a shaded position. Planted in clumps, or mass planted in larger landscaping projects or grown as a feature plant in containers. Although Asplenium australascium can be grown as epiphytic ferns the most common landscaping use is planted in the ground. Height – 1 to 2 meters. Spread – 3 meters plus on an advanced plant in ideal conditions, usually around 2m. Foliage – Pale to mid green, slightly undulating and marked with a dark red central rib. Position – Filtered light to dappled shade. Soil – Moist, well drained, humus rich. Asplenium australascium or Birds Nest Fern is available from the following wholesale growers.